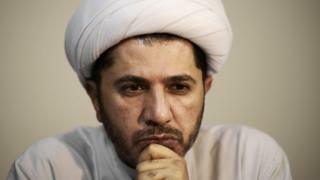 Bahrain’s opposition leader, Sheikh Ali Salman, has been handed a life sentence after the Court of Appeal found him guilty of spying for Qatar. The ruling comes just months after the Bahraini High Court of First Tier acquitted Salman of the charge of “colluding” with the rival state. Human rights group Amnesty has described the decision as a “travesty of justice” amid Bahrain’s “continued crackdown on dissent”. “This verdict… demonstrates the Bahraini authorities’ relentless and unlawful efforts to silence any form of dissent,” Amnesty’s Middle East and North Africa director Heba Morayef said. Qatar crisis: What’s it about? Bahrain’s public prosecutor said the three men were jailed for “acts of hostility” against Bahrain and “communicating with Qatari officials… to overthrow constitutional order”, according to news agency AFP. But the accusations, which date back seven years, only came to light last year – after Bahrain, Saudi Arabia, the UAE and Egypt cut links with Qatar. The allies accused the emirate of supporting terrorist groups and of being too close to Iran – allegations the emirate has vigorously denied. Demonstrators – mainly led by the majority Shia community – took to the streets in February 2011, demanding more democracy as part of pro-democracy uprisings across the Arab world. Ever since, the Sunni-ruled Bahrain has been wracked by unrest. In response, Bahrain – a key ally of the United States and the UK, which both have naval bases in the country – has outlawed opposition groups, while hundreds of government critics have been jailed.